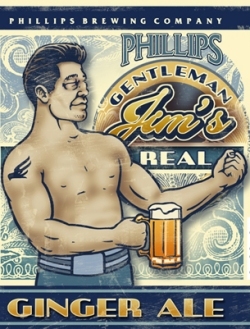 VICTORIA, BC – In addition to the previously mentioned Crazy 8s Annu-Ale and Rifflandabräu, Phillips Brewing have announced a third limited edition beer for the autumn, Gentleman Jim’s Ginger Ale. This copper ale will hit you with a few flavourful jabs of ginger before walloping you with the full spectrum of taste. This new seasonal is named after legendary prizefighter Gentleman Jim Corbett who changed boxing from a primitive pursuit into the scientific sport it is today. Like Gentleman Jim, this fiery ale is not a heavy puncher, however it can still put you down for the count, but will graciously shake your hand when you come to. Gentleman Jim’s Ginger Ale is available for a limited time in 650 ml bottles at select beer and wine stores in Victoria and surrounding areas.